The Circle has always been a useful shopping centre for the Carshalton end of the estate and some remember it as being a little more 'up-market' than Rose Hill. Shops have come and gone over the years. Now residents feel that competition from larger shopping centres and supermarkets means that, in common with many smaller centres, its glory days are past. Here are some memories of it. Perhaps you can add more? My dad had a barrow up The Circle with a friend called Curly Knowles. They started it from scratch and it got quite an established business up there. Curly decided to buy a shop in Carshalton Beeches when I was about 15, so I decided to leave school and help me dad on the barrows, which we kept going till I was about 28 years of age. Enjoyed it very much. A beautiful parade of shops which had everything on there that you could possibly wish for. On the far side of the the parade there was a hairdresser, Co-op, butchers, café, another greengrocers. There was a pie and mash shop, a wool shop, a Post Office, a a wet fish shop and an ironmongers. And on the side of the shop, where my shop is now, there was a greengrocer on the corner, a bakers, confectioner, Circle Traders selling furniture and giving a bit of credit - another confectioners shop. There was a bakery, a United Dairy, Liptons, butchers. Our barrows were opposite the butchers shop which was an ideal position for both of us. Boots the Chemist, a pet shop, Gerrards, which is the shop that I've now got. There was a Tesco's, another butchers , a small gents' hairdressers and a small shoe repair shop. A fish and chip shop and then the shop on the end - we never could quite work out what they could sell in it - but we think it was a lino come floor shop. But that was a parade of shops where you could get everything you wished for. A thriving little community and it was a joy to be round at the time. It really was. This page was added by Cheryl Bailey on 03/08/2010. One of the sound bites talks about the smell of the Ironmongers, yes a smell that stays with you for ever, wonderful mixture of paraffin, candles, turpentine creosote and mostly I think the kindling they use to sell to light your fire with, which I think was tied with tar paper string. Sometimes the kindling would be brown so maybe came from old railway ties. The pie and mash shop used to sell jellied eels, and if money was tight many would just buy liquor and mash, when I came out of the army I moved back to the estate with my wife, who was a country girl, while I was at work our neighbour had knocked and said she was going round the Circle to get some liquor and mash and would she like some, my wife had no idea what she was talking about, so just said no thank you, when I came home and explained that it was just the liquor the eels were cooked in with mashed potatoes, the look of amazement on her face was priceless. I am not sure if it was the Circle or Rose hill, or maybe both that had the greengrocers, that had long windows, with recessed doors and if you stood in the doorway, pressed your nose against the corner of the window, with half of your body in the recess and half in the street you could see your whole body reflected somehow and if you raised one arm and one leg it would look as if you had both legs off of the ground, we did it every time we went in or near the shop, something that the comedian Harry Worth did at the beginning of every show. A real treat as a kid was to have pie and mash on a Saturday night. My Nan would send me off with a jug for the liquor and the money and I would get the 151 bus to the circle. The problem was coming back because the buses weren't that frequent so I would hold the pies over the top of the jug to try to keep it all warm. She would put a quart of ale in a jug, a poker in the fire and when it was red hot, warm up the beer-- none of this cold stuff in those days. Years later I would have a night in the Arms with my mates and straight over the pie and mash shop afterwards and it has stayed with me till this day, I still love it. My dad was a driving instructor in the 60s and 70s and sometimes when I was on school holidays, dad used to let me sit in the back of the car while he was teaching. I remember with great affection the times we used to stop at lunchtime and go to the cafe at the circle. Dad knew the two brothers who owned it and they used to make a fuss of me when I went in. We always had their bacon and onion roly poly which I still adore to this day! The shops at the circle were fairly mixed - there were several greengrocers and I think three butchers. A cafe, a sweetshop, a newsagents, a couple of grocers - the Maypole, the Co-op and a United Dairy shop. Boots the Chemist- had a waiting area by the dispensary with a large dark brown wooden bench that had a drilled out pattern on the seating part and a box for placing used medicine bottles. The scale for weighing babies was also in this area although there was a clinic opposite. There was a men's hairdressers with a ladies salon at the back owned by the redoubtable Mrs King - her son played in a band backing Tom Jones - where you could buy hair lacquer in plastic tubes to re-fill the squeeze bottle used for hair spray. The Maypole had a special machine that was supposed to check the freshness of eggs - it was illuminated from below and as you purchased your eggs they were placed on the machine - I never did find out what was supposed to happen if the egg was bad!!! I had almost forgotten the joys of a company called the Circle Trading Company - they did at one time even sell records - but they were the origin of the infamous 'Tally Man' a sort of cross between the shopping catalogues of today and a loan shark. They would call on the houses on the estate offering an easy payment scheme on anything from dresses to household goods. Usually young men with a very persuasive line in patter probably learned on a market stall somewhere - some of the young wives on the estate were relatively easy prey - hence the need to visit 'Uncles' on occasions. I remember the barber's shop. In the 1940s to early 1950s it was my duty to take my younger brother there for his hair cuts. As a young boy he had very blond curly hair, of which my mother was proud, and I was always instructed to tell the barber to give him , "Short back and sides and not too much off the top". I felt too uncomfortable as a child myself to give instructions to an adult and so the words were never said. The barber would give him a short cut all over, and I would always be in trouble when we got home, unable to explain that shyness was the cause of my disobedience. We lived in Shap Crescent Grove - he sold everything you needed. My friend Sylvie James (nee Gray) and I used to walk there together frequently to get things our mums had run out of. In our road there were lots of children all around 11-13, hardly any cars and we used to play outside our house on the green and had 'seasons'. There was marble season, roller skate season, rounders, hopscotch and it seemed the sun was always shining - I'm sure it wasn't! We also used to have a May Queen and King on May Day and everyone dressed up, so much fun making our own entertainment, so much different today. We lived at 492 Middleton Road, between Peterborough and Shrewsbury Roads. 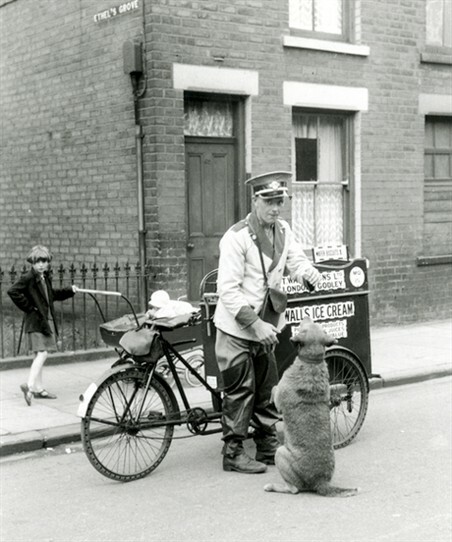 Mum always sent me round to "Ted's Van" in St. Alban's Grove, to get her some stockings or cigarettes. I was allowed to buy some sweets if there was any change left. Round the Circle was also a Dairy and sometimes when the milkman went inside and left his cart out on the street, his horse would stand up onto the pavement into the doorway of the shop trying to follow his driver into the shop. The Pie and Eel shop had live eels in the window and as kids we used to watch the guy inside chopping them up on a block to cook. The eels were still moving when they were in pieces! I never ate them but loved the pie mash and parsley sauce (liquour). My young brother who went to Tweedale Rd school also used to spend his dinner money in the pie and mash shop. Probably the healthiest food he ever ate cos he's never ate anything else green! The "Oil Shop" as it was known, as was GWL, where we were sent for a gallon of Parafin. You could also buy ball races of all sizes which were used to make scooters and trolleys. I assume now that these ball races were ex ministry stuff after the war. I was so pleased to discover Ted Thompson's memories of the Circle. I knew Harry Knowles (I assume his nickname was Curly), one of the two barrow boys during the years 1955/56. As well as being an entrepeneur, Harry was also a jazz fan who ran a weekly jazz club in the backroom of the St Helier Arms during the years 1955 to 1956. As a young and aspiring jazz drummer living in Pershore Grove at that time, I had the great honour of playing occasionally with some of the top musicians that he hired. My memories are listed under the St Helier Arms, a chequered history. This is a treasured period in my life. If Ted has any more photographs of the Circle barrow boys as well as the one shown, I would love to have a copy. I am now retired and living in Niagara On The Lake Canada. Great to find this site, My dad was the barrow boy that they called Curly Knowles and many memories that I can share, I also have a collection of old photos as dad was also a keen photographer. Sadly he died in 1973 aged just 49. Names I recall from those jazz club days are Red Price, Eddy Calvert and Kathy Stobart. I would have been about 6 years old. A very pleasant surprise for me to read the comments about the St. Helier Arms and the backroom jazz club from Terry Knowles , although sad to learn of his dad's early passing. Harry and the jazz club connection hold a very special place in my memories and I am reminded that I played with Red Price ( thanks to Harry ) in the backroom club. At the time , the St. Helier Arms was considered a respectable neighbourhood pub. I hope that Terry can post one of Harry's photographs of the Circle from that period. He was certainly a well known local character. Hello tel, blimey it's been a long time, I've got some good memories of your mum and dad ( Harry & Olive) I used to live next door to you in Middleton Gdns, remember? We had loads of fun when we were kids, how's your brother Harry, and is your mum still about? Tel I still feel guilty about your front teeth. Good luck Tel. Nice to hear from you. I'm in Sussex now and Harry is on the coast. Unfortunately Mum died in 1990. Don't worry about my teeth, I looked like Bugs Bunny anyway. You did give my ice-cream wafer a good bashing and that cost me 3d....but after 50 odd years I'm not bearing any grudges. Do you remember your Bonneville? I remember when gangs of yobs were looking for a punch-up and they caught sight of you and legged it! Hello Les, really good to hear from you, you done me a right favour when you bashed those bugs bunny teeth out , to be honest I should not stand so close to the batsman when wicket keeping,I still dine out on that story even today. Harry is ok he lives on the coast. 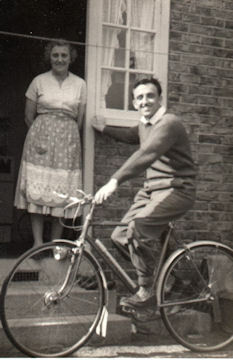 I was born in Buckhurst Avenue in 1942 and lived there till we moved to Cornwall in '53. I remember going to the Circle shops with my mum, probably on the bus. I am pretty sure I recall a shop with live eels in a metal tray and can see the heads being chopped off when sold. The greengrocers on the corner at the Circle was owned by my family - my mum and dad ran it throughout the war years. The shop was probably called L. Collen - he was my grandfather who had five sons, all greengrocers who all traded under his name. My father, Vic Collen was the only son not called up - he was turned down on medical grounds - so he kept a watching brief on all the shops. He and my mother lived above the shop. I was fostered by Mrs Young who lived in Peterborough Road on the St Helier estate. This was to allow my mother to work in the shop. There were, of course, no imported fruits so at times when British fruit was not available my father would build huge and fancy displays of vegetables. The only staff were my Aunt Joan whose husband Henry was in the Army. Henry actually owned the shop. The other member of staff was Percy - I believe that Percy eventually owned the shop - he certainly worked there for many years. In the seasons my father took hop pickers to Kent and potato pickers to Lincolnshire.They all travelled in the back of his lorry together with bits of furniture - and all the kids! Despite rationing there was a certain amount of trading between the various shopkeepers - out at the back yards of course! I do remember the oil shop - chandlers? - and its peculiar smell and the sweet shop probably about two doors down from us where you got your sweeties in a twist of paper. Sugar came in blue paper twisted into a cone. Odd how much comes back once you start thinking about it. 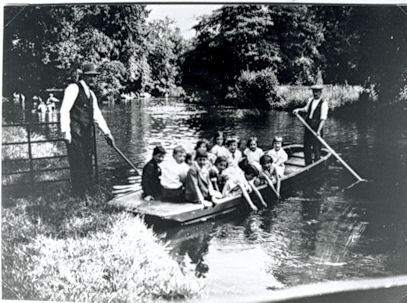 I used to go fishing on the Wandle down near the Goat but was warned not to go too near the Fever Hospital. A lovely reminder of past days when I could utter "What larks", some of which follow.I came to Sherbourne Crescent in 1934 from Bermondsey so the open streets were an adventure and a revelation. The boy next door Ronnie Good and I would go to the 'Big Wood' in Green Wrythe Lane to chop small trees down for firewood. We would walk to Kenley or Whyteleaf to collect bluebells to brighten a smile from mother.Catch a ride on the small gauge railway to The Circle newsagent where I picked up papers to deliver before school at Welbeck Road each morning, while Ted was sometimes vending sweets from a barrow in the area. Later, an incendiary bomb fell on the St. Helier Arms at the Circle as my Dad was doing his bit in the Home Guard. I remember myself and Ron Pope from Peterboro Road escorting a jewish lad to school to protect him from unthinking others. Head Master Mr. Mathews who came to my brother's funeral is another treasured thought. So many flood back of a joyous childhood. Thank you. I remember the Circle well I lived in a prefab in Willow road. I used to go the Circle for our pie and mash, great times. Our neighbour next door Mary worked for the pie and mash shop she did the liquor, we always had a gateau from the United Dairies shop next door for Christmas they were ordered a week before and were made using cream from their dairy. Phil Vandersteen - I also lived in Willow Road - No17. I think we were neighbours? I recall you had a sister ..... Linda?? 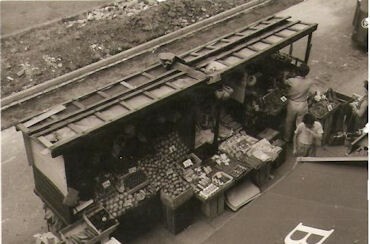 Does anyone remember the people who had the egg stall in RoseHill market in the 70s. He had a son called George and another son Micky they used to box. we lived near the circle in Winchcombe road in the 60/80s. I used to live in the prefabs at the bottom of Culvers Avenue in Birch Crescent. We stopped off at the Circle every Saturday morning to get my Bunty magazine from the newsagent on the way to dancing classes at Middleton Road. That would have been early to mid 60s. My dad often mentioned a bloke called Curly. I imagine it was the chap who had the barrow. Dad, Peter Norman, went to the 'Arms' which I think was the St Helier Arms. He sang a lot in pubs - don't know if he sang there. I loved the atmosphere of the Circle with the stalls and the shops. Great hearing all of these memories.